I've had quite a few interesting snacks from A Taste Of The States now, and recently they have started stocking more Australian varieties. The Cadbury Dream we all know and miss was sadly out of stock so I went for a Cadbury Top Deck instead - you know, those bars we used to get in the UK many moons ago? It's a simple combination of a base layer of Dairy Milk and a top layer of Cadbury Dream white chocolate. This may sound pretty standard but it turns out it's a winner! 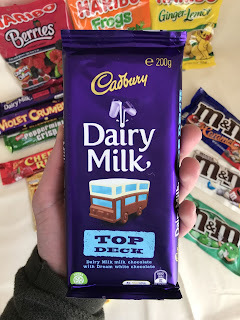 The Dairy Milk layer tastes pretty familiar, although I maintain that Australian Dairy Milk is a little better quality than our UK version. It seems creamier and less waxy. The upper layer of Dream is pretty sweet and creamy and like Dream used to be, and perhaps it's better mixed with Dairy Milk so you get a mix of sweet creaminess and cocoa mingled together. This is a great bar and super moreish. 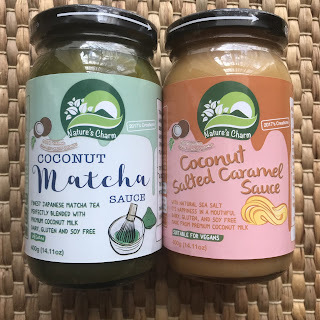 Many thanks to Nature's Charm for sending me some of their Vegan Coconut sauces to review recently. I've featured them before with my Condensed Coconut Milk review, and I really enjoyed that so was even more excited to see what these were like. It's hard finding dairy free alternatives to popular products, but luckily the market is gradually expanding to cater for all, and these fit in nicely. They are made with coconut milk, coconut sugar, sea salt and other natural ingredients. 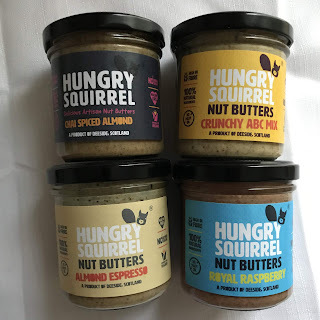 A huge thanks to Hungry Squirrel who kindly sent me some of their of tasty nut butters to review recently. They are a Scottish company based in Deeside and their nut butters are all vegan, gluten free and some are even sugar free. One has also won a "Healthy Choice Scotland Food and Drink Award". Woo hoo! The flavours they sent me were Chai Spiced Almond, Royal Raspberry, Almond Espresso and Crunchy ABC Mix. And I have to say I loved them all and can see why the ABC mix has won an award. The ABC Mix consists of almonds, brazil nuts, cashews and sea salt - no sugar! And it honestly didn't need it - it tastes creamy, nutty, salty and savoury all in one - presumably the cashews give it a natural sweetness. The brazils give it an earthy taste that mixes well with the other nuts. I seriously loved this and couldn't get enough! 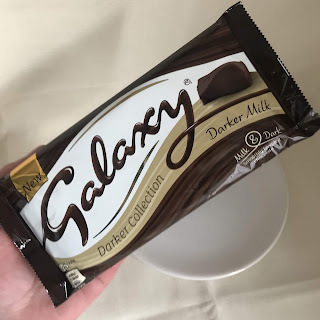 Since the Cadbury Darkmilk surprised me with how nice it was, I thought I'd review one of its new competitiors in the form of this Galaxy Darker Milk. The name itself amuses me - it's almost a sly implication that it's darker and thus better than Darkmilk. But is it? Firstly, it contains very different ingredients to Cadbury Darkmilk. The cocoa solids are 33% (much less than Darkmilk's 40%) and the ingredients contain lactose and whey protein, as well as palm fat. The Cadbury Darkmilk is already ahead of the game in that respect since it doesn't contain palm fat. Firstly I have to say I like the block design of this bar - it's sleek and curved and a lot nicer than the Darkmilk. The 110g bars are available from Tesco and Asda now for around £1.50, and there's also a Hazelnut variety. My apologies to Degustabox for being so late doing a full review of their boxes lately. They've sent me a few so far which I mentioned on Instagram but haven't found the time to do a full review of. 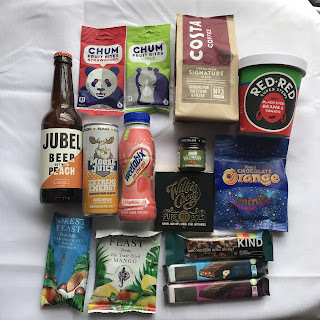 The February box I've already mentioned so I'll skip to the March box which was quite interesting, with a nice mix of both healthy and naughty snacks and some drinks and even a beer for good measure. 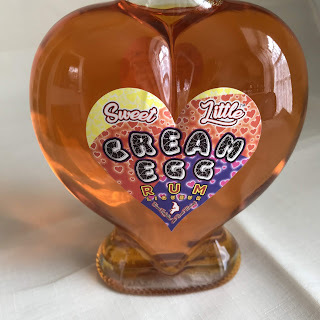 Sweet Little Drinks recently announced a new Cream Egg flavour rum to coincide with Easter, and lucky for me they kindly sent me their new creation to review. Thanks so much Sweet Little Drinks! You can find it on their websitealong with several other interesting gin, rum and liquer flavours. There's combinations like Bounty, Rum and Raisin, Banoffee Pie, Donut, Pear Drops and...Maple Bacon! I was of course super curious if this would taste like Cadbury Creme Egg. Note that it doesn't use the actual words Crème Egg, which I presume is because of copyright, but we all know that's what it’s meant to be. The alcohol percentage is 18%. I chilled it in the fridge, and after a long stressful day poured some into my Root 7 glass. The perfect glass for a drink like this. 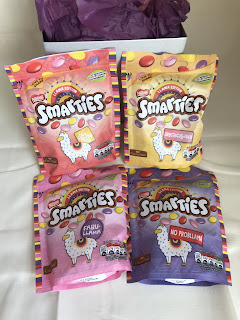 Nestle recently sent me some of the new Smarties Limited Edition, or rather "Llama Edition" to review (I know, jammy so and so etc), and I have to say I am very pleased that Llamas are now becoming the new Unicorns, at least with Nestle anyway. The unicorns have had their day and need to be put out to pasture thanks very much! Of course, with them being Llama themed they get their own colours...which are apparently pink, red, yellow and purple. I don't know who came up with the colour scheme but I guess it works. As well as that there's 4 different bag designs with different puns on, which is...fun. Things like "No Probllama" and so on. The Smarties taste like any Smarties, sweet and delicious of course. It's a shame there's no orange ones in there and also that there isn't any new flavours, though I understand there's some difficulty producing flavoured ones due to costs and manufacturing processes etc.